Fun Interactive programs. Practical Application of course contents. The session will be conducted by : Mrs. Lakshmi Srinath, Founder-Director of Girijamba English Foundation (GEF), English Language Communication Skill Trainer, IELTS Trainer – British Council Certified. This course costs Rs. 2100, and open for anybody to attend. For the past few months, we have been having a lot of fun on Friday evening – we don’t work! We hack on some open-source gems, work on some internal ideas (gems, rails projects and techniques) and we found it to be very useful (and fun). We decided that this could be a good idea for the community – so every Friday @ 5.30pm, anyone interested in Ruby and any Ruby related technologies is more than welcome to over. If you have an idea and want to get the Ruby community to build it, you’re welcome here – you can propose your idea and if there is a quorum, we can work on it. Yourself and your laptop if you want to code. We shall provide snacks and soft-drinks at our office. Beer sponsors – always welcome! Contact gautam@joshsoftware.com if you want to show your appreciation. This group is for people interested in Arduino, Raspberry Pi, Sensor Electronics and in general ‘The Internet of Things’. With the help of this group, we would like to help foster a DIY culture and engage with educational institutes to introduce arduino kits for fun learning. HasGeek has arranged a day-long set of talks on the Applications of Machine Learning on 5th July, in Pune. In machine learning and natural language processing, a topic model is a type of statistical model for discovering abstract “topics” that occur in a collection of documents. At Helpshift, we get a lot of customer support messages. We use topic modelling and more specifically the Latent Dirichlet Allocation (LDA), to classify similar message automatically based on messages. These grouped messages can be processed by the CS personnel making them more efficient. This talk will cover Helpshift’s experience and the challenges in using LDA for grouping similar messages without any prior knowledge. 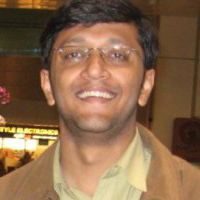 Vinayak Hegde is VP of Engineering at Helpshift. In the past, he has worked at Inmobi, Akamai and Microsoft. In the brick and mortar days, the shopkeeper interacted with a live human customer with appearance, expressions and behavioural traits. These attributes influenced the way the shopkeeper pitched his goods. Flip to the current e-commerce world where you are interacting with a cookie which was dropped when a customer visited your website. How does an e-commerce store know the appearance, expressions and behavioural traits of a customer? Based on those characteristics, how does the sales pitch change? Where do these conversations happen? In this session, Rahul Kulkarni demonstrates with real-world examples how big data from cookies translates into appearance, expressions and behavioural traits of the customer, and most importantly how these are used to make a killer sales pitch for the customer. This session covers case studies which use some of the classical as well as cutting-edge machine learning algorithms. Due to ill-conditioning and noisy nature of financial data, there are some unique characteristics of this problem that we will focus on. Robustness of modelling methodology, averaging of models, identifying what is true improvement in prediction accuracy versus over-fitting become some of the serious issues people will need look into. In online advertising domain, there are various players which play a different role working on behalf of either publisher or advertiser, directly or indirectly. These players interact with each other in real-time to select the best advertisement optimizing their individual goals. Sreekanth Vempati will present key optimization and real-time impression allocation challenges solved using Machine Learning by different players in the advertising echo system. As a part of this talk, he will present broadly about PubMatic’s work with Machine Learning and their applications. Specifically, Sreekanth will show some of the Machine Learning applications in online advertising domain, showcasing some of the problems that are being solved in PubMatic. In this talk, Nilesh Phadke will discuss Text Analytics and how it can be used for better IT management. The talk will cover an Introduction to Text Analytics, going over the basics of what is meant by Text Analytics followed by some of the key techniques involved in Text Analytics and how these techniques can be used to improve IT management solutions. Google IO: One of the biggest global tech conferences is going to take place in San Francisco on June 25-26, 2014. GDG Pune will present screening of Keynote for the members. Join us for new updates, learning, discussion and awesome food !!! Akanksha and Sana who are participating in Rails Girls summer of code this year will talk about their progress so far. They are working improving output of heap dump generated by Rubinius. Amit Thawait will give talk on “Integrating emails with Ruby application using mail gem & postfix”. The purpose of this group is to spread awareness of Ruby Pune. PRUG wishes to engage with students interested in learning Ruby and Ruby related frameworks like Rails, Sinatra, Rhodes, RubyMotion and any others! PRUG is a group of Professionals working in Ruby, sharing experiences, solving problems, giving demos and presentations. Students and people new to Ruby are more than welcome! Freebies and promotional activities are encouraged. Exploring new technologies for creating, publishing and viewing 3D content and data on the web, for consumers. IT software companies face the classical dilemma of make v/s buy – that is, engineer their entire products inhouse, or pick certain relevant portions from leading technology / platform vendors. Building inhouse entails long development cycles, and often the market has moved by the time the product is ready. By partnering with SAP, such companies can not only speed up their Go to market, but also leverage SAP’s brand and leading technologies in Big Data, Mobility, Analytics & Cloud to enter markets and rapidly build transformational solutions for their customers. This session will share some examples of the work SAP’s partners are doing with customers – large & small – across the world, and offer new routes to market for partnering with SAP. Siddharth Hosangadi is a Business Leader with over 15 years of experience spanning several industries, geographies and functions. He has been employed with SAP India since 2005 in various sales and leadership roles, and currently leads SAP’s Strategic Initiatives and New Routes to Market in the Global Partner Operations organization. Prior to joining SAP, Siddharth worked in the IT services industry in MNC’s like Satyam and Ness Global Services, where he sold consulting solutions and professional services to customers in India and Singapore. Siddharth started his career in ICI India, as a Regional Sales Manager for their Specialty Chemicals business. Siddharth is an active community leader, and counsels groups of families on Life Skills and Bhakti yoga in his spare time. He has been a visiting speaker at various business schools, and counsels and mentors MBA students around topics like communication skills, career planning and stress management. Siddharth received an MBA degree in 1997 from the Jamnalal Bajaj Institute at Mumbai University (a top 10 business school in India), and he has taken formal training in Leadership, Strategic Selling & Effective Public Speaking. He received his B.E. degree in Chemical Engineering from UDCT (top Chem Engg institute in India) in 1995. Fees : 150/ members and 300/- non-members of TiE. Most awaited Developer Conference Google I/O is on its way. GDG Pune presents Google I/O Extended in Pune on June 25th. On extensive demand of GDG member’s and follower’s we are going to showcase Google IO live streaming on 25th June at 9PM IST. at PIIC karve nagar, Pune. We also organized event of key notes on 5th July at Synerzip Kothrud. Organizations that are subject to HIPAA (Health Insurance Portability and Accountability Act), need to comply with the Privacy, Security and Breach Notification rules defined by the US department of Health and Human services (HHS). This topic will discuss how organizations that have implemented Information Security Management System (ISMS) as per ISO27001, can readily demonstrate compliance with most of the HIPPA security rules, by mapping their ISMS policies and Procedures to the Privacy and Security rule requirements. Computer Society of India (CSI) is one of the oldest computer science user groups in the country, and CSI Pune is has been one of the most active chapters in the country by virtue of its numerous activities and contributions in various fields. It has helped the people in implementing computerized systems in various sectors such as Industry, Banking commercial, Public sector Research and Development establishments and Government departments. With several programs and a strong IT professional network, the Pune chapter has been a part of the growth of Pune’s IT industry. Working at the grass-root level, the chapter has also contributed toward stronger computer education is various ways. With chapters in various colleges in Pune, CSI has a very wide reach amongst the students of computer science too. Inc42 Magazine, TLabs and Nasscom 10,000 Startups have teamed up to bring India’s first highly curated event for early stage startups, StartupDash, which will act as a catalyst for startups in MVP stage. It is coming with a complete package of Launchpad, Team Building, PitchUp and Mentorship opportunities in 3 major startup focused cities – Delhi, Pune and Bangalore. Some of the people attending the event are Shashank Deshpande, Rohan Dighe, Avinash Sethi, Baishampayan Ghose, Navin Kabra, and Anand Ovalekar. In this session we would like to present a case study of our experience with AngularJS. We’ll go over the practical challenges we ran into (…that are typical use cases for any rich internet application of today…) and how we addressed those challenges using various features of AngularJS. This session will assume that the audience is familiar with fundamental AngularJS constructs and mechanics. The main aim of the session is to share knowledge among developers who have some experience of using AngularJS in the wild. This will not be an ‘introductory’ tutorial-oriented session. For those who’ve not used AngularJS before and still wish to participate, here are some great resources to get you started with AngularJS. Persistent System presents a talk on the life and work of Turing Award Winner Leslie Lamport, on 28 June, 2pm to 5pm, at the Dewang Mehta Auditorium, Persistent, SB Road. In March 2014, Leslie Lamport was named the 2013 winner of the Alan Turing Award of the Association for Computing Machinery(ACM), widely regarded as the Nobel Prize in computing. Over the past 40 years, Lamport has made several foundational contributions to the theory and practice of distributed computing. His early work includes the Bakery Algorithm for the mutual exclusion problem and an insightful paper on the importance of causality in a distributed system. He later investigated fault tolerance in the presence of so-called Byzantine failures—worst case scenarios that could disrupt the correct functioning of a distributed system. His distributed consensus algorithm Paxos is widely used in many modern replicated data storage systems. A recurrent theme in his work is the importance of precise specifications and formal reasoning in ensuring the correctness of concurrent systems. Social-Mobile-Analytics-Cloud (SMAC) technologies will play a significant role in the building of next generation software products and solutions. Building solutions on this SMAC-stack requires a unique set of technical skills, different from the traditional software programming. This talk will focus on some of the upcoming SMAC trends and the skills needed to stay relevant as these trends unfold. The Turing awards, named after Alan Turing, given every year, are the highest achievement that a computer scientist can earn. And the contributions of each Turing award winner are then, arguably, the most important topics in computer science. This is year 2 of the the Turing 100 @ Persistent lecture series. The series started in 2012 to celebrates the 100th anniversary of Alan Turing’s birth by having a monthly lecture series, and the success of the talk series in year 1 has resulted in the series being continued in 2013. Each lecture is be presented by an eminent personality from the computer science / technology community in India, and covers the work done by one Turing award winner. This is a lecture series that any one in the field of computer science must attend. These lectures will cover the fundamentals of computer science, and all of them are very relevant today. All the slides and videos of all the talks in the last year are available here. Take the Post-it note. Have you ever considered that someone put a lot of time into its appearance? The movie explores the unconscious but influential relationship we have with the objects around us, and why the smallest tweaks in design make an enormous difference. Nearly everyone spends their life surrounded by the work of industrial designers, but very few people understand the process by which your furniture, cell phone, or alarm clock came to look and feel the way they do, and how the elements of design interact with our own ideas and assumptions about value and functionality. Objectified, which features interviews with a number of major designers who discuss how products move from the drawing board to the marketplace, and the philosophy behind the look, feel, and function of the things in your home. As an entrepreneur one is constantly intrigued by the deluge of accelerators and incubators that exist around the world. What options exist for you as an entrepreneur? As you look to startup in Pune which ones make sense for you? Listen to a panel of startup CEOs and founders talk about their experiences and perspective on leveraging accelerators and incubators. Dr. V. Premnath holds a B.Tech. from the Indian Institute of Technology – Bombay and a Ph.D. from The Massachusetts Institute of Technology, USA. He has also been a Chevening Technology Enterprise Fellow with the Centre for Scientific Enterprises, London Business School and Cambridge University, UK. Avinash Shenoi, CEO and Founder, Instaclique. Participated in Target’s accelerator. Avinash has a Bachelors degree in Computer Engineering from Pune University and Masters in Computer Science from the University of Maryland, USA. He has experience and expertise in successfully running several startup companies across two continents.He has built and led teams to design and build enterprise products for Information Security, compliance and custom software development. Sarang is an Innovator my mind and Entrepreneur by heart. He has a BE from Govt COE Pune and PhD from SUNY Stony Brook, NY, USA. After 12+ years experience working at 2 startups and a Fortune 100 company he moved back to India to pursue the dream of starting up on his own in India. He has over 40 publications, holds 5 US patents and has 14+ patent applications in the field of medical image analysis. Nitin Gupta, Founder & CEO, Navstik. Experienced with options from Government bodies. Nitin is a technopreneur, and has been working on engineering R&D for over a decade. He did B.Tech and M.Tech from IIT Bombay, and MS in Aerospace Engineering from University of Maryland. Nitin has been involved in multidisciplinary research on modeling, simulation and automation of dynamical systems. The Author who is also an investor critically analyses each method, its pros and cons and should you attempt to try out these methods. There is a FUND-O-METER at the end of each story to help you judge the merits of this approach. This event is free and open for anybody to attend. There is no registration required. Lighthouse Insights and The Other Guys are celebrating Social Media Day in Pune. Agenda: Come greet, meet like-minded people, have a drink, gossip more, make new friends and drive back home safely. The event is not restricted to social media experts, it is open for all as man is a social beast. They are trying to spice up the event, will update soon. Food and Beverages: They are not yet funded to help in your food and drinks bill but they have got an offer from the good guys at Jimmy Hu. Pay Rs.350/- and have 2 Beers + 1 Starter. Is that exciting enough? Want to drink more the bar is all yours! Registration: It is a free and open to all event. Please register here: http://lighthouseinsights.in/social-media-day-pune.html/ – they promise not to add you to their newsletter. TechWeekend Pune 7, on Mobile Application Development was held on Saturday, 19th Feb. These are the live-tweets, collected here for your benefit. Remember, they are live-tweets that were being typed while the event was happening, so they’re not necessarily as coherent and as well-organized as a regular article. This talk is a basic overview of Windows Phone 7. Important now, because Nokia has now thrown its weight behind it. Mobile phone world suffers from large number of devices of different resolutions that behave differently. This is not true of Win Mobile 7. Windows Phone 7 insists on a standardized hardware & screen configuration. So your Win Phone 7 will always look and behave the same. WinPhone7 will always have these sensors: A-GPS, proximity sensor, accelerometer, compass, light. App Development for WinPhone7: regular apps using Silverlight, and game apps using XNA. The XNA framework for game development is mature and widely accepted – because it was in XBox 360, Windows and Zune. WinPhone7 developers get all the goodness of Visual Studio for developing mobile apps with Visual Studio 2010 Express for WP. Other developer tools: Silverlight Dev Kit. XNA Game Studio 4.0. Expression Blend 4.0. Also VB for WinPhone7. All these development tools for WinPhone7 are free. This was followed by a walk through of building a WinPhone7 app using Visual Studio 2010 and Silverlight. Q: Does WinPhone7 support multi-tasking. A: No. Some standard system services can run in the background; but apps don’t multitask. Next up: Rohit Ghatol talking about cross-platform mobile app development using phonegap, titanium etc. Two ways of developing cross-platform apps. 1. Develop html5 apps for webkit. 2. Use a translator that translates your app to native code. Q: Will a webkit based app work with WinPhone7? A: No. But Mango release of WinPhone7 will support html5, so you should be close. So with PhoneGap app development, you’ll probably be doing UIs by using JQueryUI or something like that. Note: PhoneGap ultimately creates a native app that users install. Not just a website that they visit in the browser. At this point, Rohit, showed actual PhoneGap code for a mobile app – to write an app that shows a google map of my current location. Big challenge of PhoneGap is that you need to bring your own UI development framework. This is an advantage also! – PhoneGap allows you to have same UI framework for website as well as your mobile app. You have two different directories for images – one for Android, & one for iPhone, because they handle images differently. iPhone requires just one size of images. Android allows different images for different screen sizes/resolutions/orientations. Building your own webkit based cross-platform framework makes sense if you want to overcome limitations of phonegap/titanium. This won’t be as clean as phonegap/titanium, but might be good for your specific case. Steal phonegap/titanium code if required! Next speaker was Anand Hariharan talking about Android Performance tuning. For app performance: first focus on what the user wants, don’t just improve performance for the sake of improving performance. Optimize only after measuring performance, and having specific performance goals. A lot of performance tuning, is really about managing user perception. When doing something that will take time, keep user engaged. Don’t optimize everything for performance – you don’t have the time. Focus on the most important user visible features and fix those. In mobile world – reduce features and use the time saved on fixing performance. Manage user perception better: e.g. Apple’s use of loading a bitmap image of app at beginning to give impression that app has loaded. At app startup time, load a bitmap that looks like your app without the latest data. Gives impression that app load is fast. Performance tips: All platforms have a “recommended best practices” doc. Read that – many developers dont 🙂 e.g. Android best practice: for tasks that take time, use a background service (not an activity). An android app is single-threaded. So don’t do io (network or disk) synchronously. Use an async mechanism. Keep activities small. Don’t overload activities. Use different activities to do different things. Use the minimum number of views. Do not use a deeply nested view hierarchy. Your view hierarchy shouldn’t be more than 3 levels deep. If you’re views are getting complicated, consider writing custom views. Track memory allocations. Garbage collection happening during user activity causes slowdowns. Close your cursors. Otherwise garbage collector cannot reclaim memory. Then you get GC cycles, and slowdowns. Use SoftReferences to cache data so that the garbage collector can reclaim the memory when required. Avoid database writes as far as possible. Writes take 5ms to 200ms. And full SD card has slower writes. Avoid using data from mutiple tables in a single list (AdapterView). First copy data from multiple tables to a single table and show that. e.g. in Email app, subject and body came from different tables. This really slowed down the inbox view (which shows first line of body). Tools to help with android app optimization: Fix your views using: hierarchyviewer, layoutopt. Check flow & times using: traceview. Use zipalign to optimize your apk (improves app load time). Above all, you must understand what you’re optimizing and why. Measure, measure, measure. The good folks at IndicThreads, Harshad Oak and Sangeeta Oak, organized the IndicMobile conference. The venue and arrangements were very good and the set of speakers top notch. The choice of topics was varied enough to be comprehensive and yet very relevant and amenable for deep enough dives. Overall, a great interaction and learning opportunity that I and my colleagues enjoyed. I also enjoyed live tweeting along with Saurabh, PuneLive, Mukund, Vishvesh. Here are my notes from the conference. They are longish, but then it was a two day affair, and I have tried to be brief. As expected, there was deeply thought out articulation from Anand on the future of the software space. Mobile + cloud is ‘it’, he said. Economic sense is driving everything on the cloud and that, combined with the all pervasive mobile technology will rewrite the software world, as we develop and use it today. He referred to the Harvard Business Review C.K. Pralhad and R. A. Mashelkar paper and pondered that more will be made available for less, for the many – elucidiating Gandhian principles. He made a core point about the data being separated from the App. I like Anand’s ‘cows and milk’ analogy: focus on milk, why care about tending cows ? Applied to software, focus on developing and using software (App), not building the cloud. But – to take the analogy further – what control one has on chemically adulterated milk ? Its very difficult to even identify that. And, what about reliability and security and so on on the cloud ? Or is there a business case for the ‘organic software experience’ ? We as software product developers will have to figure it all out. Nice coverage of cross platform mobile development tools. I didnt know there was no garbage collector on the iPhone while there was one on the desktop. Titanium can be used for building cross compiled native apps on various platforms. It also has a good reference application that can be used to test all kinds of interfaces of the device you are building for, as well as sample code ready to be used. MoSync and PhoneGap were also covered. All three were demoed. He warned that tools can be out of step with device styles and new devices. He also suggested that a mobile web app could be the route of choice for maximum platform coverage. I noticed mere mention of MeeGo, but after all, its too new as of this writing. [See MeeGo related previous post on this blog. Hemanth covered the various Adobe tools. Interestingly, none of the attendees present had developed for the platform so far. He pointed out that while designing for multiple screens, especially small, knowing the screen resolution was not enough and that the physical dimensions, the orientation and pixels-per-inch (PPI) were crucial. Amongst many other things, he mentioned DeviceCentral as a useful tool to test for devices that support flash. While iOS does not support flash, its cool that Adobe has ActionSript3 cross-compilation for iOS – it generates a native iOS application. He demoed real fast development of an app that gets twitter trending topics. His live demo broke by a whisker – must have kicked himself, mentally – he then showed us previously built code. Still cool. I would have loved stats (performance and so on) comparing native apps with similar functionality. All-in-all, a compelling write-once-run-anywhere-on-air story by this Adobe evangelist. Need to seriously evaluate the platform. Bala had the difficult task of keeping us awake after lunch. He spoke all about the various platforms one can develop for, for Nokia devices, including the Symbian, Maemo and MeeGo. And of course all about Qt. I wasn’t expecting a Nokia representative to pronounce Qt as ‘quetee’. Everyone knows its ‘cute’, pun not intentionally intended 🙂 He revealed that 83% of users downloaded apps rated 4 and 5 (of 5). Shows how crucial it is, to build a high quality app that includes a great user experience. He advised to design for the user, not the technology, and consider the emotional engagement of the user with your app. And some more tidbits and tools and resources. Given that Qt is the development platform of choice on MeeGo, and a lot of Qt development is done in Python, I wonder why C++ is the language of choice for Qt/Meego. Its like going retro, no? BlackBerry just released the Torch and that has the BB6 platform. They have tieups with advertisers and an API that developoers can use in their apps. RIM does 60% revenue share with the app developers. BB SuperApps are native apps that are always on and connected, proactive and notification driven, highly contextualised, designed for efficiency in terms of network usage, battery life and so on. The Theme Studio and Theme Builder lets you make themes easily. The Playbook is coming. This platform is one to watch out for. Lately, BlackBerry devices have started delighting more and more number of users, notwithstanding their funny ads, and they have a powerful development platform plus increasing marketshare to entice developers. Have you noticed how, the moment you start discussing something related to design, that hovers closer to art and makes the audience remember their most delightful and very frustrating moments with technology, everyone just tunes up their attention to the level of communion. Holy Photons ! This is exactly what happened in Navin’s session. He declared: “Touch will take over the world”. He made many excellent points, one being that using a mouse is a learned skill while touch comes naturally and that every app developer irrespective of whether he will develop for the mobile platform or not, will need to care about touch, simply because touch based devices will be the most commonly used devices going forward. Also, a piece of text that is large enough for you to read is not necessarily large enough to touch – you will know this if you browse the web on your touch phone. Touch can be so easy that our spinal cord should be enough to do processing and give our brain some rest – everyone could do with that, I suppose. He showed a very interesting design of a touch keypad that can be used singlehandedly to browse the web because it has most of the frequently used functions on convenience buttons. He also touched upon – pun intended – the problems with touch, user perception of what is good and bad response time, caution of not overdoing it and perhaps most importantly, that developers wanting to design for touch must use a touch only device for a sufficient period of time ! I really liked the mindmap style (including the navigation) for the presentation. Made a mental note to make one this way at the next oppurtunity. Abhinav (an attendee) made an excellent point about designing in such a way that, with all the touch he can get, the user is still able to efficiently ‘blind type’, assuming he also has a physical on-device keyboard at his disposal – touch and type should not go out of sync. Really interactive and great talk on how to design for touch. And some informative follow-on interactions around stylus vs. fingers, resistive and capacitive touches, and handwriting recognition, the Palm (now Access) Graffiti et. al. I personally feel there is huge potential for handwriting recognition or at least the Graffiti on the mobile platform – too many potential users who know native, local languages are currently ignored and can be empowered to communicate for low costs, in ways that come naturally to them. Venkata explained Samsungs dual strategy with Bada (means the ocean, and does not have roots in the Hindi ‘baDaa’ i.e. big, as someone said to me) being for the low end devices while the other mobile OSes that they sell devices with, are for the high end devices. Looks like a large set of attendees were Android lovers and didn’t buy the Bada story but Venkata said ‘Dont grudge us our own mobile OS’. Its difficult to argue with that! He also made a wonderful observation: Customer (end users) expectations are very, very high. They want features on the phone that they may not use, but if the device doesn’t have them, they feel its handicapped. One can develop for Bada with the combination of C++ and Eclipse, plus a web toolkit. There is also a memory leak checker bundled along with the developer toolset. As others, Samsung has a lot of other pieces of the mobile puzzle being put together in their own way. ‘In-App Purchase’ – is this new ubercool feature being bandied about. IIRC, Apple, Nokia, Samsung have it, others will want to catchup. Venkat also made a great point about user psychology – it’s easier to have an app in the store that is installed by the user and which then stays on the device and tends to be used more. This app can then of course use the web as needed. But its very difficult to have the user point his browser to a website from his device. Point to be taken ! Good session by this evangelist: funny slides, cheerful demeanour, solid defence. Vikram Pendse’s overview of Win Phone 7 platform, architecture, development tools, demos and quirks was nice. He did a good job of explaining the Microsoft perspective for WP7. MS wants a consistent hardware strategy across vendors: ARMv7 Cortex/Scorpion or better, and decent combination of GPU, memory, display, capacitive touch, and sensors (GPS, accelerometer, proximity). There will be 3 buttons – Start, Search, Back. For developers, there is .NET compact framework and Silverlight. The OS supports ‘prioritised’ (not concurrent) multitasking of Apps. Libraries include cloud integration for Azure. He demoed apps to showcase various capabilities – graphics, app bar, music, UI navigation. As also a profiler. And pretty pictures of devices: Dell Venu Pro, HTC HD7, HTC Surround, LG Quantum, Samsung Focus. And some game screens. Rohit began well. He gave some background on the platform, showed a list of devices in the market and asked: Do I really have to sell Android? The audience didn’t think so anyway. He also was the first person to do a live device demo in the conference. He covered stuff efficiently – Building Blocks of Android (Activity, Service, Content Provider, Broadcast Receiver, Notification Mgr, Alarm Mgr), the Dalvik VM, the DEXs and the APKs. He was swift through building an App and covered lot of details in short time. Froyo (API v8) brings the much needed enterprise security features to Android, while GingerBread and Honeycomb come later to focus on tablet features.Developer.Android.Com is a very well documented site and a great resource to learn at. We also discussed some could-be-better stuff – one is tablet support, another is that Android market does not provide flexible payment options, sometimes you can make more money by making the app free and include Google ads! Rohit had a nice conversational style, good use cases, employed simple stepping through the development process on a well done deck. I liked this flexible approach. The audience identified pertinent topics for an open discussion and we had scintillating set of discussions on 4 topics. Difficult to capture all learning and speakers, but I hope I’ve got the gist. Abhinav, Mobile Virtualization: Can we run multiple logical phones on one physical phone ? There are multiple applications. 3 years ago, you ran your PC at 1GHz, today you run your handset at that speed. In terms of device capability, virtualization seems plausible. Clouds will only separate the data from the device. What if you want to use your corporate mobile and your personal mobile on the same physical handset, for convenience ? Saurabh, OpenGL: Useful for graphics and game development. Optimal use of hardware resources. Common library across platforms, however, support varies across platform. Simple games like ‘Bejeweled’ are being used more over serious games that need a console, simply because they are more available, like while waiting for the doctors appointment. Dr.Lavania, Tele-Health: What is the best way to reach 24×7 touch and feel health services to rural areas, given that mobility is the only ubiquitious technology in villages! Apps that degrade from smart to dumb phones are needed. What low cost solution can we have for villages that are ‘over the horizon’ of connectivity? Anand had specific advice – dos, donts – for Android apps in particular and Java apps in general. Do lookup his presentation on the conference site, it has a lot of depth and coverage – a handy reference for all developers, I’d say. Fluent talk, and I thought, Holy Photons – worth emulating! Romin has written a book on Google App Engine and you can download it for free. GAE is feature rich and free, has enough resources for trying out apps. He did a quick run through basics, and did a live demo – write, test, deploy! Simple, klaar, not cloudy at all. 🙂 You can code in Python or Java. Cloud in general and GAE in particular has great potential for mobile space. You could have the same cloud app serve multiple phone apps or even multiple kinds of clients (thick, thin, remote, local, and so on …). Romin mentioned a handy resource for information on about 15,000+ devices ! Checkout WURFL. All presentations uploaded to the conference page as the talks got over. Pleasant green behaviour on part of organizers – free saplings were on offer for those who care. See the Press Report in DNA. An intense and thoroughly enjoyable conference with a lot of take-aways for me. Hope you have enjoyed reading about it. Atul has a Masters in Computer Science from the University of Pune. His areas of interest are Technology in general and Software in particular. He studies Indian classical music, is a nature lover. He builds embedded products and Mobile Applications for the iPhone, Android, Symbian and BlackBerry platforms. Atul was 2008 Employee-of-the-Year at his workplace, and recipient of “Project Management Excellence Award” (for his team) by PMI, Pune Chapter. The smartphones market is very fragmented. In 3Q2010, Symbian had 37% of the smartphone market, Android was second with 25% (it was at 2% 18 months ago), and iOS in third place with 16%. RIM (Blackberry) was next. Windows was losing. So, what should a developer do? Which to target? HTML5 is here already. I was under the impression that HTML5 is something that will arrive sometime in the near future. Romin pointed out that HTML5 support is pretty good even today, especially if you’re thinking of mobile phone browsers. But HTML5 not the answer to all your problems. If you need access to device sensors, you’re probably better off with a native app. If you want access to the appstore/marketplace, then you need a native app. HTML5 doesn’t qualify! There are some limitations, and such apps aren’t as good as native apps. Titanium and PhoneGap are rapidly getting better and better. More and more apps built using them are showing up on the android marketplace. If you are a software outsourcing company that’s building apps for third parties, you should seriously considering building a team that uses Titanium. For most of your customers, you’ll be able to quickly complete an app that satisfies them. Otherwise, you’re faced with a nightmare – you’ll need to build teams with expertise in each of the major platforms, and this is almost impossible to do with today’s attrition. An app built Titanium/PhoneGap can go on the appstore/marketplace. An HTML5 app necessarily requires you to have a “cloud” presence – a web server and an API, and supporting all the online connections. PhoneGap/Titanium application does not require any of that. 3 days ago, Google announced that it would stop the development of Wave and would stop supporting it by the end of the year. Even though the buzz about Wave and the (visible) progress of Wave was low for the last few months, the shut down is surprising: I would have expected a re-launch, a change of the architecture, integration with gmail – anything, but not a complete halt – The concept behind Wave is right and ahead of its time – and Google could have been a leading player in this space! When I looked at Wave for the first time right after the announcement one year ago, it struck me, how similar the concepts were to what we were working for years with Colayer. I started Colayer in 99 – suffering myself the mess of email communication. As a travelling business consultant I was convinced, that this can not be the way we will communicate in future! This is fundamentally wrong! – I mean: the basic idea of SENDING information on the web is wrong! (You GO TO and ARE ON Facebook, twitter, yahoo – you don’t ‘download’ it.) Google Wave addresses exactly these same issues. The Notification – the way the users would be notified about updates in their many waves. If you would use this product in a real world scenario with heavy communication, it would not work! – But Wave was at its very start. We thought Google would quickly realize the problems and implement solutions for it – and with their market power, Google would be able to initiate the paradigm shift in online communication. But after the Wave launch, it seemed that innovation stopped. Yes, there was development, improvements & many extensions were released. But the above 3 problems were not addressed. They couldn’t be solved through improvements or extensions, but needed fundamental shifts in the product design – which never happened. And as many users seemed to loose patience too, Google pulled the plug for poor user adoption after only one year. Maybe another problem of Wave was, that Google choose the wrong market: Wave was intended for the broad consumer market, as well as for enterprises – But the paradigm shift happens elsewhere first: If you observe today’s kids and young nerds, you can imagine, how the next generation of businesses will use online communication: Email for them is ‘lame’ and just used for communication with outsiders, older people and the ‘conservative’ business world. Why would you need email anyway in a world of Facebook & Foursquare? After 10 years, we are still in the beginning of the massive paradigm shift of online communication. I am eager to see, who will join the journey next! Wave is a web application for real-time communication and collaboration. Announced in May 2009, Wave attracted a lot of attention for a couple of months. The project was stopped by Google after just a little more than one year for poor user adoption. Markus Hegi founded Metalayer (now renamed to Colayer) 10 years ago. The Colayer platform is a software technology to create collaborative web sites. Colayer is a Swiss-Indian company with headquarters in Zurich, Switzerland and development center in Pune, India. Markus ‘commutes’ since 10 years between Zurich and Pune and spends almost half of his time here in Pune. See his linked-in profile, or follow him on twitter. See an overview of articles about Colayer vs Google Wave on colayer.com. Where: Orbett Hotel, 123/2 Apte Road (Opposite Shreyas Hotel), Deccan Gymkhana, Map. Pune GTUG presents Android Jumpstart Seminar. A seminar where we would get people excited, thrilled and ready on Android Platform. The objectives of this seminar are as follows: introduce Android, introduce the building blocks and architecture, talk on building an Application on Android comprising of all the building blocks. Lucky draw winner wins an HTC phone from the sponsors of this event Quick Office and Synerzip Softech.